One of my favorite things about teaching knitting classes is that moment when a student's eyes light up because something I just taught them has advanced their understanding of our craft. Its happened many times and I never tire of it! 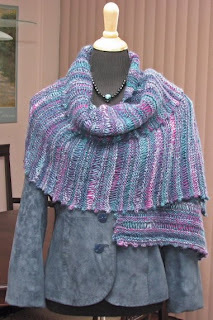 It comes into existence at that intersection of skill building and when the Knitter is ready to absorb the next building block of knitting knowledge. One of my cherished memories is of a relatively novice Knitter who I was teaching how to knit "backwards" (left to right as opposed to right to left). Less experienced Knitters pick this skill up faster as their muscle memory isn't as firmly ingrained. She looked up at me and said "I'm never going to purl again" in a totally deadpan voice. Don't be fooled by that sweet little face. She eats yarn! No she is not cute when she does it. She does not play with the balls of yarn. She sneaks up quietly and when you least expect it she chews the strand of yarn leading from the current project to the ball that it was flowing from. All Knitters who visit my home must be warned as they take their knitting out of their bags. Sometimes I forget to tell them and she attacks quickly and quietly. I also have to explain to all our visitors why we have no toilet paper in the holder. It's because she eats that too. No it's not like the cute kittens in the commercial who unroll the paper Gracie chews it up and shreds it into little bits that she leaves all over the bathroom floor. Does anyone share my pain? The pattern is called Simple Things on Patternfish. The colours of this yarn are delicious! So when people ask me for the pattern there will be one. So I can learn new "stuff"
Last night Wanda and I visited our dear friend Patrick in the hospital. We know Patrick from having worked with him at our LYS. He is very ill. We talked about knitting (what else would we talk about). It's clear that the passion Patrick shares with us for creating is helping him to overcome his health challenges. His room is full of yarn, patterns and projects in various stages of completion. Many of those who are visiting him are from the knitting subculture here in Toronto. I am totally blown away by the strength he is demonstrating in the face of a terrifying illness.